Two people talk about what they do during the week. Todd: So, Meg, are you busy? Do you have a busy week? Meg: Yes. I usually have a busy week. Todd: Yeah, me too. So what day is your busiest day? Meg: My busiest day is Thursday. Meg: On Thursday, I have to work from early in the morning until around 6:00 p.m. I have to teach classes. And then after that, I need to do my shopping at the supermarket. Todd: Okay. I do my shopping on Saturday. Todd: Yeah, always on Saturday. Meg: What else do you do on Saturday? Todd: On Saturday, I do all my boring activities. Todd: I do my shopping. I do my laundry. I run errands. I clean my apartment. I do boring stuff because on Sunday, I like to have fun. Meg: What do you like to do on Sunday? Todd: On Sunday, I often go hiking or I go to the park or I go to the beach. I go to the beach almost every Sunday. Meg: Wow, that sounds really fun. Todd: Yeah, the beach is beautiful. Nobody is there. It's really nice. Meg: Yeah, it sounds great. Todd: How about you? What do you do on Sunday? Meg: On Sunday, I always go to church in the morning, and sometimes I'll have lunch with friends after church. Meg: And then, I usually clean as well, Sunday evening before the new week starts. Todd: Now, do you work Monday through Friday? Meg: Yes, I work every weekday. What about you? Todd: I work Monday, Tuesday, Thursday, Friday. I don't work Wednesday. Meg: Oh, what's your schedule like on Wednesdays? Todd: On Wednesdays, I usually stay at home and I relax. Sometimes, I go shopping. Sometimes, I go to the park. Sometimes, I prepare lessons because I'm a teacher. Meg: So, sometimes you do a little work on Wednesdays? Todd: Yes, but I do work at my house. Todd: I never go to school on Wednesday. Todd: Because it's a day off. So, how about Monday? Are you busy on Monday? Meg: I'm usually busy on Monday because my schedule is similar to Thursday, so I have to teach class until around 6:00 p.m.
Todd: Yeah, Mondays are busy for me too. Mondays are busy. Thursdays also are busy. Tuesday and Friday are not so busy. Meg: Your schedule sounds a little similar to mine. Todd: Yeah. Well, we're both teachers. Todd: What about activities? Do you do any activities during the week? Meg: During the week, if I have free time, sometimes I will watch a TV show or a movie and I also go to Japanese language class. Meg: Yeah, so sometimes I have homework so I have to do my Japanese language homeworks some nights. What about you? Todd: I play futsal on Tuesday nights. Every Tuesday, I play futsal with my friends for two hours and that's fun. And then, sometimes on Friday, I meet my friends for dinner. Todd: And I also like sports so I usually watch sports on TV on Monday. Meg: What sports do you usually watch on Monday? Todd: I watch everything. I watch baseball. I watch basketball. I watch American football and I watch soccer. So I come home and I watch a video of a game from Saturday or Sunday. I don't watch sports on Saturday or Sunday. I watch the video later on Monday night. Meg: Is it better that way? Todd: Yeah. Usually, I don't check the internet, so I don't know the score. Meg: Well, it sounds like you have a busy schedule. Point 1: Spell names of the week with a capital letter. Point 2: In spoken English, speakers often do not say the preposition on. Point 3: We use different prepositions for some parts of the day, either in or at. Point 4: When you combine a day of the week and a part of the day, you do need a preposition, except with noon and midnight. The time of day goes after the day. I will see you Monday night. I will see you Friday at noon. Point 5: The weekend is Saturday and Sunday, and the Weekdays are Monday thru Friday. 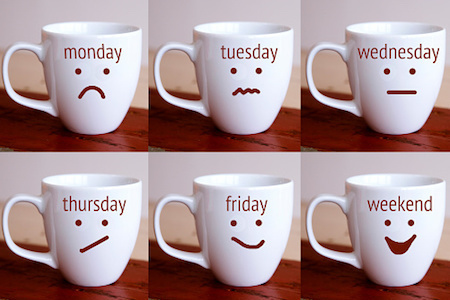 Weekdays | during the weekdays.